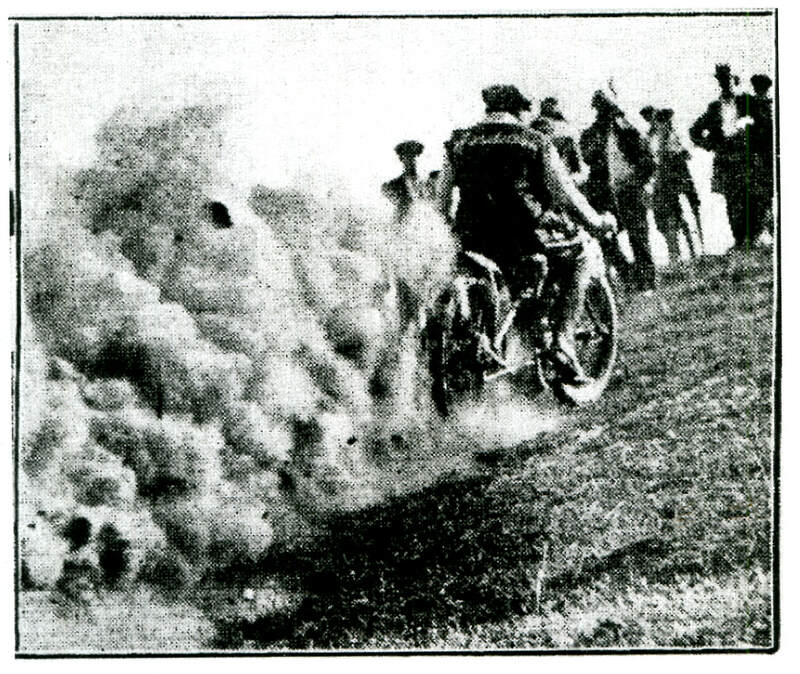 Staff photographer Barry Baker captured the thrill of the speedway and the spectacle of the fireworks display when he combined the two in this unusual picture of Bunbury solo rider Don Collins sliding through Pits Bend to victory in the Consolation handicap at Claremont Speedway. 1971 - Des Noble - Ron McDonald - Ross McNichol. 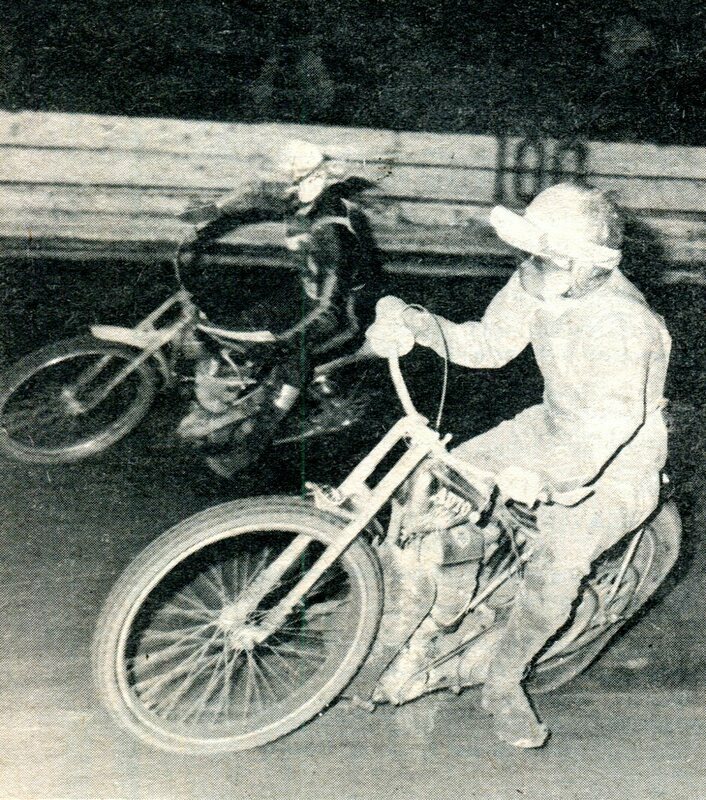 1971 - Australia's captain for five of the seven test matches against Great Britain last season, Chum Taylor takes the inside running on English sensation Chris Pusey, Taylor was one of the stars in the first 2 contests in the series which were held at Claremont Speedway. Photo: unknown. 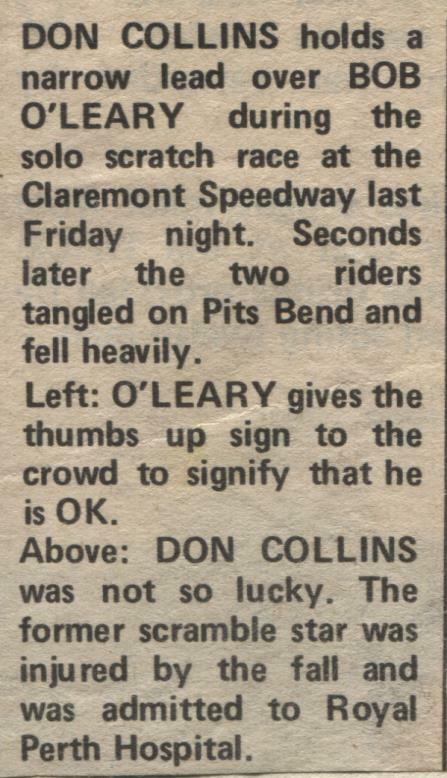 1971 - Bob O'Leary is proving almost unbeatable at Claremont Speedway, A former Australian short circuit champion and scramble rider of note, Bob is now one of the nations leading solo riders and ever improving. Photo: unknown. 1971 - 2nd: Don Collins - 1st Terry Oleary - 3rd Abe Schnider Photo: unknown. In the early 1970's Ivan Mauger first appeared at Claremont to take on the local stars, This image captures the magical New Zealander International making an inside pass on West Australian star Bob O'Leary. Photo: unknown. 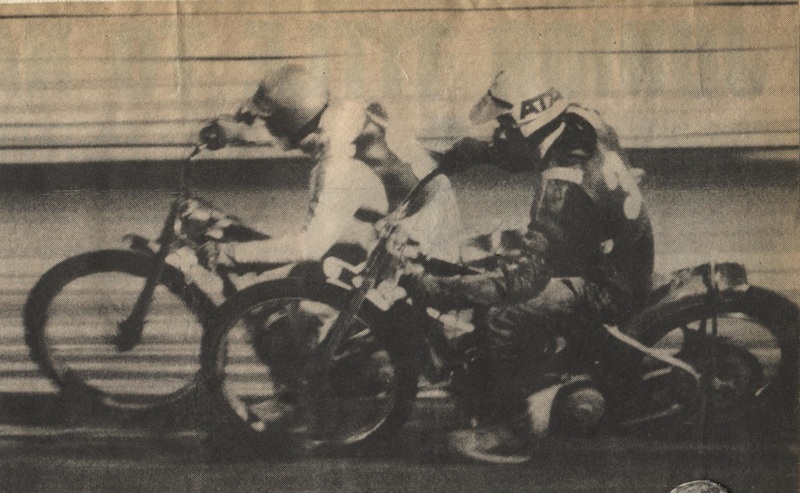 1971 - Ivan Mauger and Terry O'Leary race side by side as they lead Chum Taylor and Don Collins with Abe Schneider during heat 2 of the Governors cup, Mauger went on to win the heat from O'Leary with Taylor third. Photo: unknown. 1971 - English sensation Nigel Boocook. 1971 - Abe Scnider on the low line and Les Leisk on the high line. 1971 - Ghostie a fearless rider on any track. 1971 - Photo's: Claremont Speedway program. 1971 - Laurie Hardie takes the Carbon Brakes EH under Ben Ludlow junior in the Triumph Herald. Photo: unknown. 1971 - Kalgoorlie driver Bob Shepherd in the torana gives Rod Watson a bit of a hurry up, these 2 are amoungst the top production driver's in the state this season. Photo: unknown. ﻿﻿﻿Above: Dave Harvey leads the unknown driver in the ﻿Peugeot with Gary Earl on the outside. 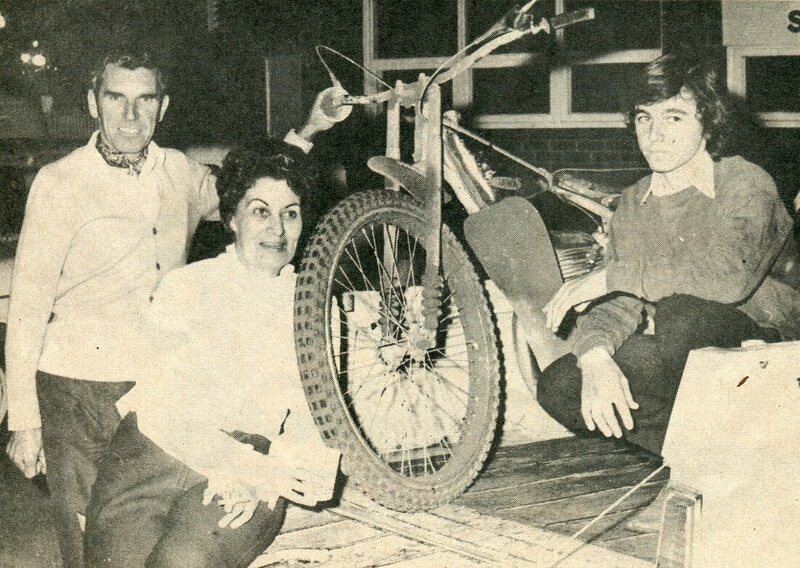 1972 - Pictured with the bike in the back of the ute is Chum Dulcie and Glyn. Photo: Peter Roebuck. 1972 - Con Migro welcomes Ivan Mauger to Claremont Speedway and later awards him after his win Photo: unknown. 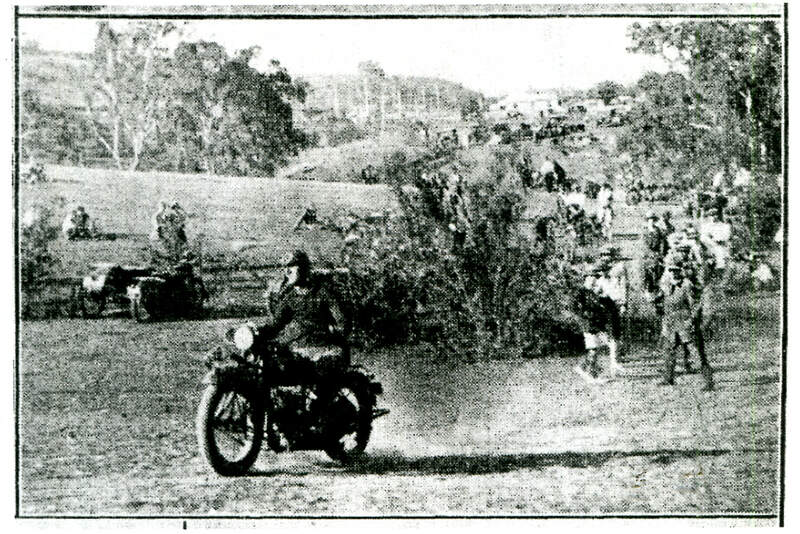 On the 10th of November 1972 Claremont Speedway hosted the Royal Agriculture Society Trophy International for Solos, The riders were from England and Australia. 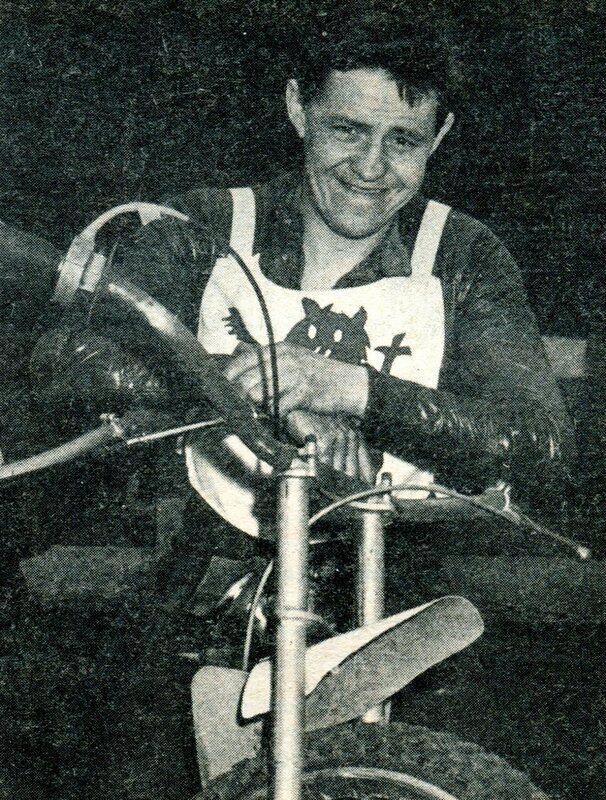 1972 - West Australian International rider Les Sharpe finished 3rd on 10 points. Photo: unknown. Peter Eccelstone recalls: I rode in that International, and as I recall Chum ended up top points from Peter Collins of England. The event was not apart of the England verses Australia Test series. After the event I recall the riders all swapped jackets. I ended up with Chris Pusey's and still have that jacket today. 1972 - Bob Shepherd from the Boulder club had a reputation as a win at all cost driver. Photo: Peter Roebuck. 1970 - John Fenton - Ron Wanless - Tony Matta - Con Migro - Geoff Stanton. Photo. Speed-Eade. 1972 - Geoff Pilgrim leads John Fenton through Fowlhouse corner. Photo: Speed-Eade. 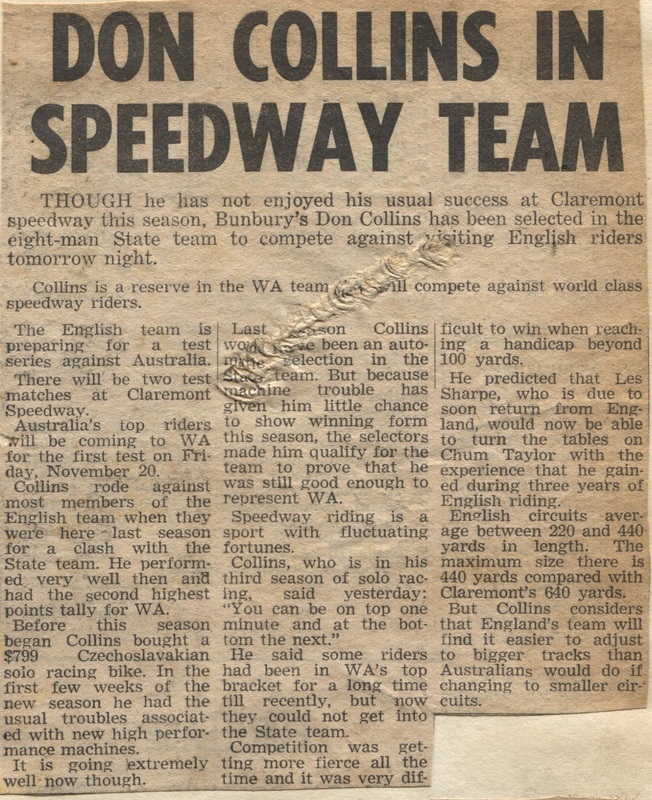 1973 - Con Migro and Radio 6KY's Graham Cherry welcome British Solo rider Malcolm Simmons to Perth and Claremont Speedway. Photo: unknown. 1973 - Solo action. 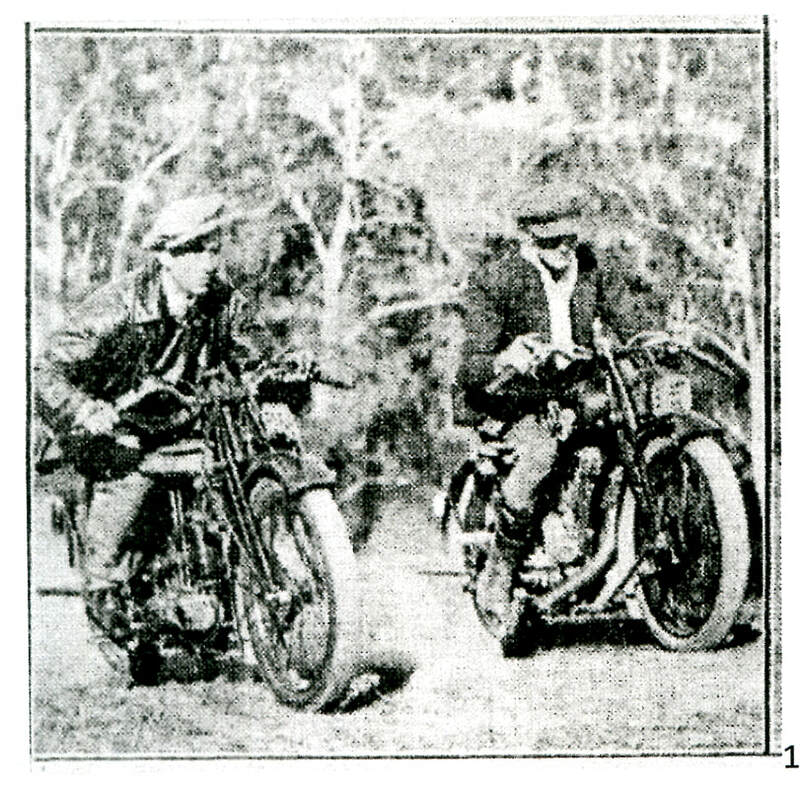 left to right Malcolm Simmons - Rod Chessell - unknown. Photo: unknown. 1973 The 4th heat gets away to a good start. 1973 British Lions Peter Collins. 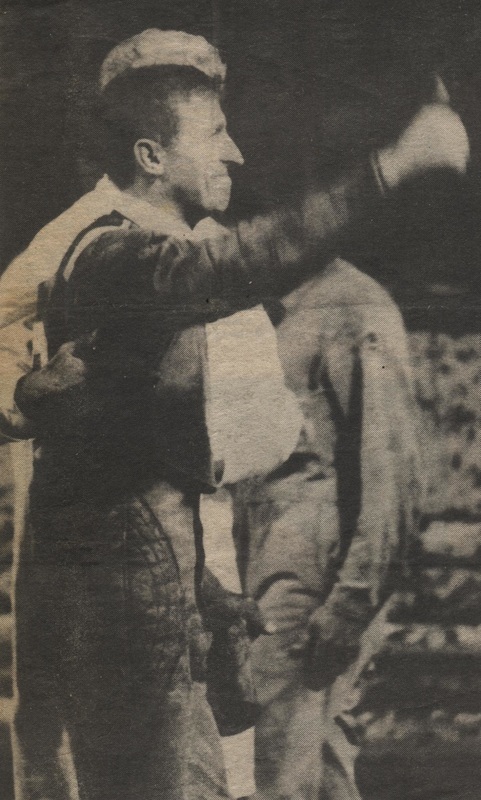 1973 - Bob O'Leary and Peter Thompson. Wally Kermond receives his award. Photo: unknown. Speedcar Chief Steward Bob Farmer must rank as one of the most efficient "Chief's" in the business, Bob's word is law in the speedcar ranks and the way he enforces the rules he commands a deal of respect among competitors. 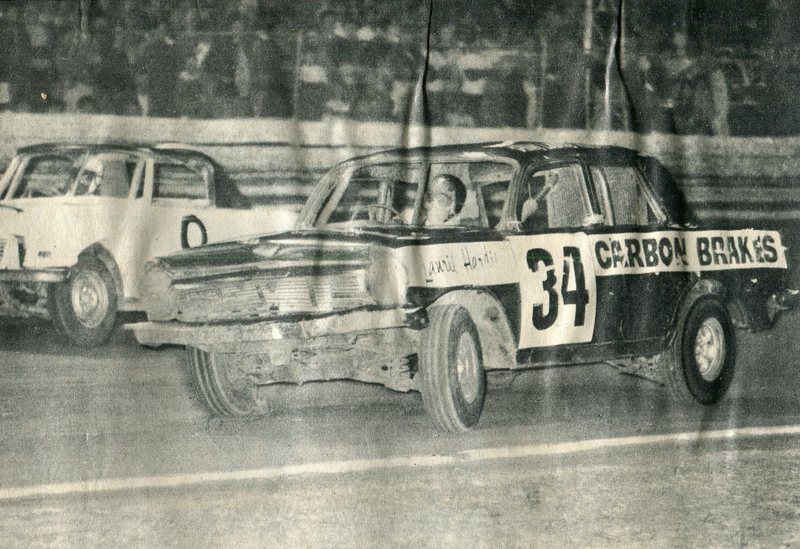 Here Bob is pictured pushing John Fenton's car onto the infield as Fenton protests, The reason for the disqualification was that JF changed a wheel after the race had started, Bob stuck to his decision and a very irate John Fenton had to sit this one out. 1973 - Geoff Pilgrim is pushed through the pits to the track by Mark"Junior" Franks and Glenn Hairs in the VW powered car with the Offy fuel injection system that Geoff adapted to the VW engine. Photo: Mark Franks collection. 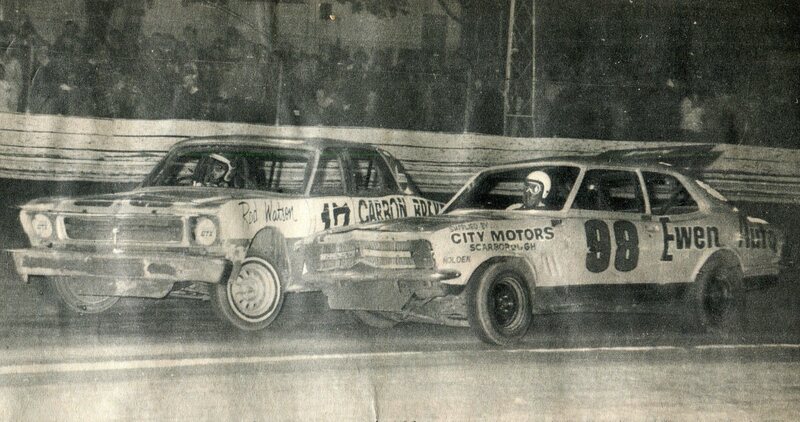 1973 Ray Hill turns around the 78 car while Des Nash drives on by. Photo: Ray Hill collection. The first fully imported American sprintcar to come to Western Australia was this Edmunds imported by Alf Barbagallo. also known as the Osbourne Park Charger. 1974 - left to right Hash Brown (super mods) - Mike Andretta (production cars) - Larry Burton (super mods) - Jim Hopkison (production cars) - Gene Welch (production sedans) Captain - Tony Carboni Team Manager - Garry Patterson (super mods) - Ed Watson Mechanic. Photo: unknown. Appearing at Claremont Speedway on Boxing night (Thursday 26th December will be the Swedish sensation Anders Michanek the 1974 World Solo Champion. This year Michanek teamed with Soren Sjosten to win the World Pairs Championships at Belle Vue (Manchester) and also scored a maximum 15 points in the world final at Gothenberg (Sweden) on the 6th of September. 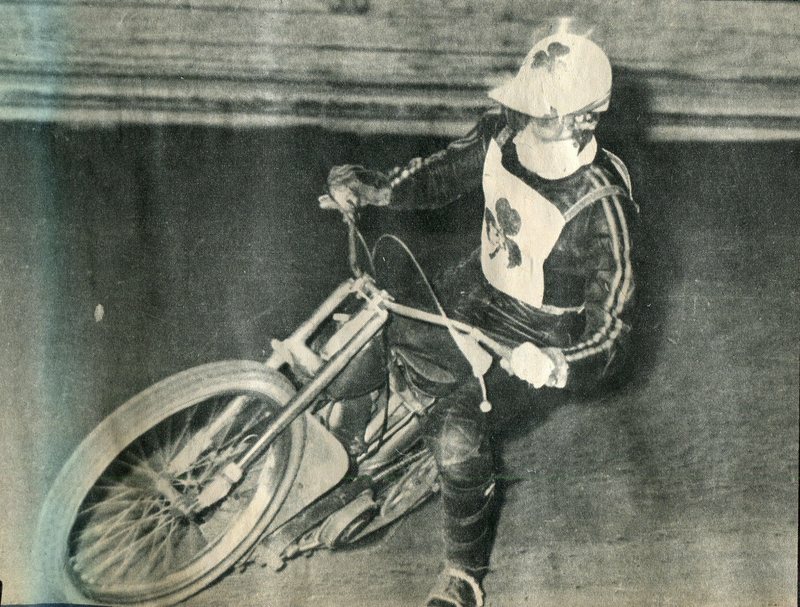 Michanek's last British League season was in 1973 when he captained Reg Fearman's team Reading to the first division championship , He also topped the riders averages in that season. As well as being a champion speedway rider, Michanek is rated among the top six long track riders in the world today. 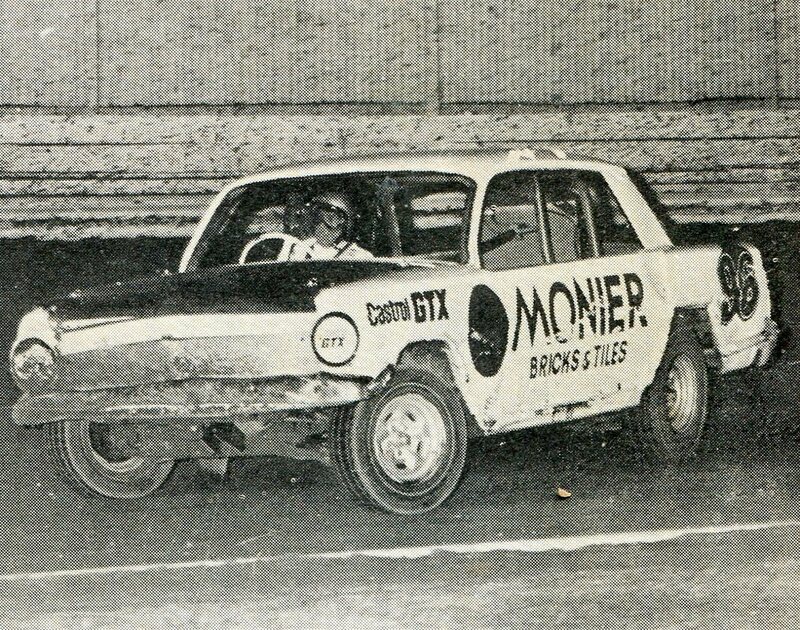 Michanek last rode here at Claremont during the 1971-1972 season, when he was the star of the Swedish solo team, He still is the joint holder of the 3 lap scratch record at 1 minuite 5.5 seconds. 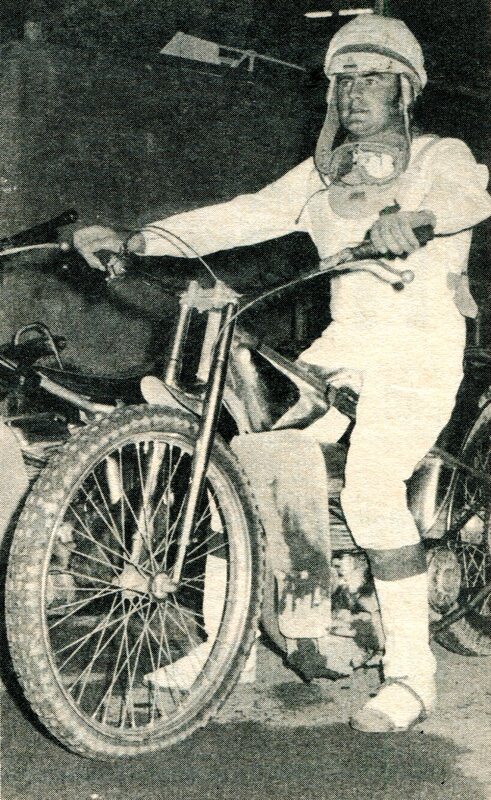 1974 - Ken Redpath Australian Champion. 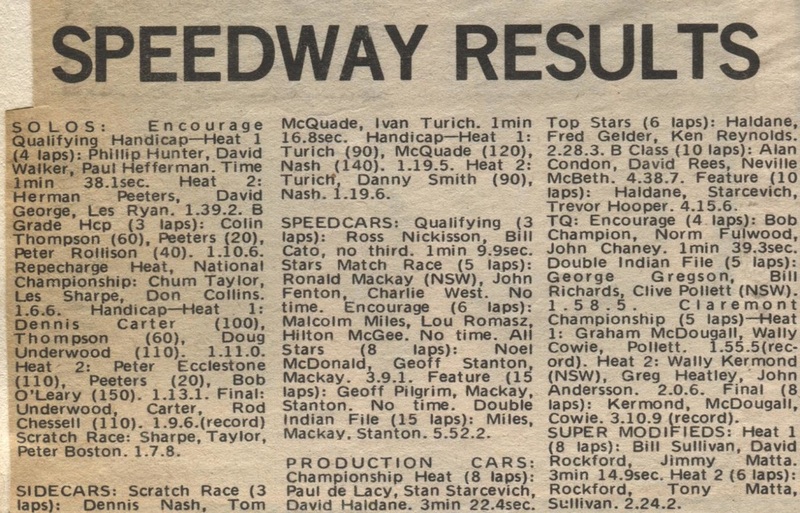 Further proof to our strength in speedway is the brilliant win of West Australian Speedcar Champion, Johnny Fenton in the recent victory of the 1974-1975 Winfield Australian Speedcar Championship at Rowley Park Speedway in South Australia. We are proud of Fenton as his is the first West Australian to win the Australian Championship, John now heads off on a tour of the East coast and New Zealand. Speedcar match race at its best Charlie West in the Wynn's Holden & George Tatnell in the Winfield Offy. The state manager of Rothmans, Mr Eddie Burgoyne, presents the trophy to Charlie West as George Tatnell looks on. A badly shaken Wayne Redman is helped from the track his car crashed in pits bend at Claremont Speedway on Friday night. 1974 - Rays Grey motor Holden powered speedcar with McGee fuel injection. Photo's: Ray Hill. 1974 - Laurie Hardie in the (34) Sydney ATS Monaro and Ken Reynolds in the Torana spin out in pits bend during the production car match race. The event was won by Alan Blake from Bunbury in a Torana. Photo: unknown. 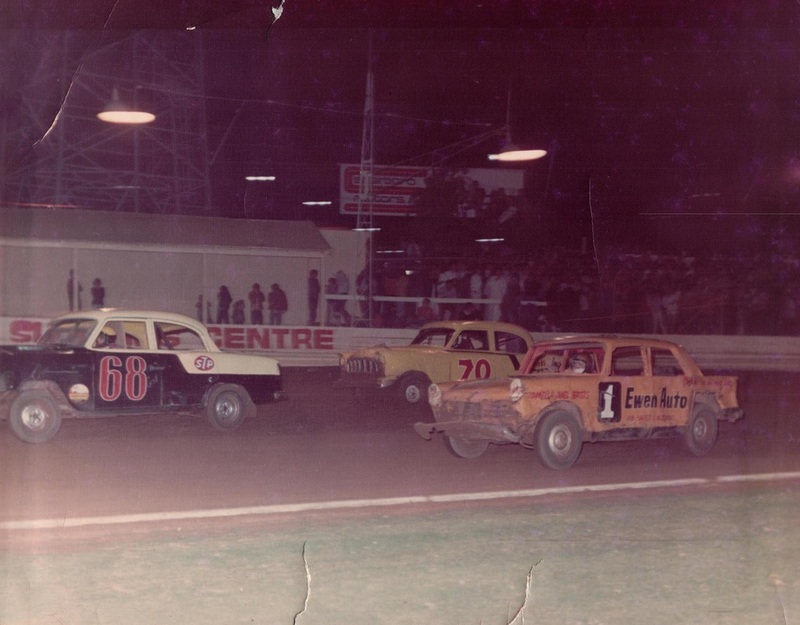 1974 - Bunbury driver Johnny Clapp in the (200) Mini gives Perth driver Barry Blake in the Auto Glass Torana. a nudge. Photo: unknown. 1974 Gene Welch brought this Camaro to Australia but the best he could manage in the West Australian Championship was fourth place. Photo's unknown. 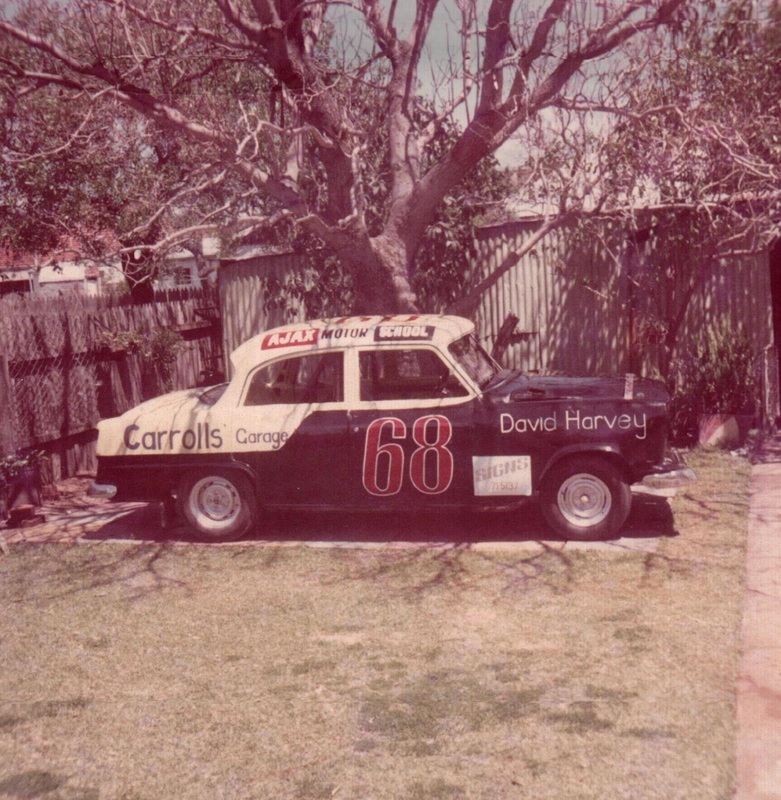 Alf's sedan car racing was only short lived, after only a few races Alf on sold the car to Bunbury business man Kevin Russell, who sat Mick Bayliss in the car. Over Easter a group of Western Australian Formula 500 drivers represented their state in the National championships at Bundeberg in Queensland, I am very pleased and proud to be able to report that the locals the locals showed they are definitely number one with Johnny Anderson winning the event from Ken Neilson and Brian Mullings. Both John and Ken filled the same positions in last season's Australian title held here at Claremont Speedway. It is my great pleasure to welcome for the very first time the 1973 United States Auto Club midget Champion "Leadfoot" Larry Rice driving a brand new Volkswagon car, Larry has swept all before him on the Eastern circuits but is sure to find his greatest opposition here in the West. Our own newly crowned Australian National Champion Johnny Fenton also returns to his home circuit after a very successful tour of the Eastern states and New Zealand, Other drivers in Bill Sutherland and Ross Nickerson are back after racing in the East and Tony Derosa returns from a break. 1975 - Perth's Bill Sutherland unleashes the power of the ex Larry Rice Volkswagon at Claremont Speedway. Geoff Pilgrim recall: John Fenton was the first speedcar in West Australia to run a roll cage, this came about because John was at the time racing on the East coast were roll cages were introduced, The only problem was West Australia had not yet approved the use of cages, so John was forced to remove the cage before racing at Claremont Speedway. Unfortunatly for John his full harness seat belts weren't changed over to the old lap belt and "Sam Brown" type belt that was mandatory in Perth. 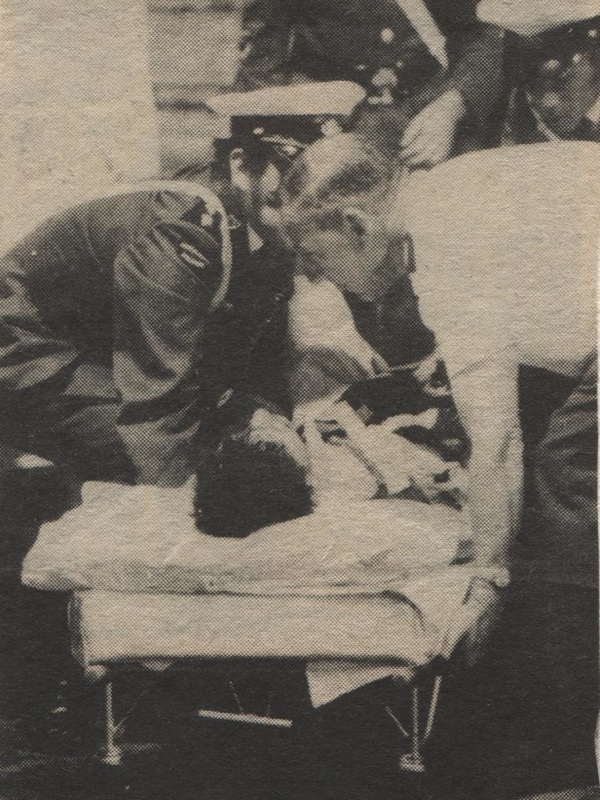 During a race at Claremont John accidentally collided with the rear of Noel McDonald's car when entering Fowl House corner, John received bad injuries as he was not able to "duck" out of the way when his car rolled over. John came back from terrible injuries to continue being the top speedcar driver in Australia. 1975 - Allan Nylander in the Falcon spins to the infield as Big Ed Wilbur drives by in the Camaro . Photo: unknown. 1975 - Nothing new about Bert getting together with another competitor, this time its Barry Blake Photo: Peter Roebuck. 1975 - Vic found the going hard against the more established American bodied rear wheel drive cars. Photo's unknown. 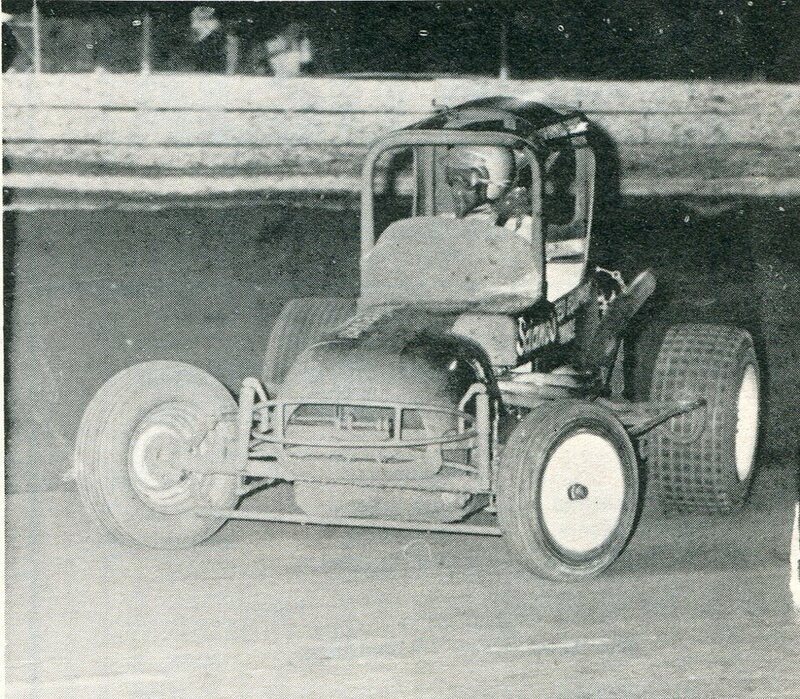 Royce Fitzgerald from Darwin did buy this Cobra powered car off Ray in 1974 while in Adelaide, However this photo shows Ray taking out a feature win at Claremont in January of 1975 while running the Fitzgerald signage.